Silver picture frames offer a timeless look that can be as versatile and unique as art itself. From ornate baroque aesthetics to neo-classical styles, modernism, and contemporary design, these silver-colored wood picture frames have a place in any setting. Our sizing wizard is designed to use the exact width and height of the artwork or picture you wish to frame. We add the necessary amount to allow your glass or canvas to have a little room inside the frame for expansion and contraction. 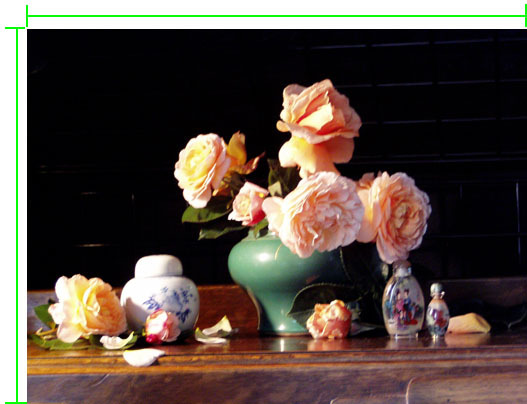 The following example shows a stretched canvas or a watercolor image on paper. The green lines are indicating where to measure the art. Enter the exact width and height you measure as the "artwork dimensions" in the area above. V498 is a simple, warm, shiny silver wood picture frame moulding with clean lines and a narrow profile. The metallic finish offers subtle hints of distress that add charm and distinguish this wood moulding from smoother finishes such as aluminum frames. The hue of the silver is more yellow than blue, and on the lighter side in terms of light value. This finish sits on a gesso base, which is applied to the wood substrate. This silver, neoclassical picture frame highlights the timeless, elegant characteristics of the American Federal style of the 1800s, while remaining relevant in a contemporary, modern setting. The profile starts at the inner lip with a slightly rounded duck bill shape, followed by a recessed flat body, and then a multi-step convex ridge that ascends toward the outer edge of the frame. The profile of this silver picture frame starts at the inner lip with a duck bill shape, followed by a flat recess about 1” wide, from which a series of rounded steps incline toward a peak at the outer edge of the frame. The profile width is 2”, and the rabbet depth is 5/8”. The profile width of this silver picture frame is 3”, and the rabbet depth is 5/8”. Whether you are framing a ¾” thick original painting on stretched canvas or framing matted works on paper, this substantial frame has a commanding but simple presence that speaks to the importance of the artwork without distraction. This timeless federal-style silver picture frame features a substantial width to give prominence to the art on display, with plein aire style paintings being a likely candidate for pairing with this warm silver profile. The width is 3 3/8”, and the rabbet depth is ½”. This classic cosmopolitan silver wood picture frame by Omega Moulding offers a universal aesthetic that complements a variety of styles and genres of art and decor. The profile starts at the inner lip with a swan shape, then a recessed flat span, followed by an ascending ridge and a black outer wall. The profile width is 2 1/8”, and the rabbet depth is ½”. This silver flat-panel cosmopolitan wood picture frame by Omega Moulding offers a versatile aesthetic that pairs with a vast array of styles and art influences. The profile width is 1 3/16”, and the rabbet depth is 3/8”, making this profile most ideal with matted works on paper due to a limited depth. This moulding is a medium sized, voluptuous wood profile, featuring a warm, aged silver finish with slight distress markings. The inner part of the frame face is flat, followed by a small upward step, then a convex round over arch leading to another small step downward. The final step toward the outer edge of the profile is a steep bevel that transitions into a flat side. The purpose of each step in the profile is to catch the light and emphasize the silver finish. This antique warm champagne silver wood picture frame offers a distressed look that complements soft and subtle landscapes and works on paper. The profile width is 1 5/8”, while the rabbet depth is ½”, making this profile most ideal for thin items. Artwork that is thicker than ½” may be secured with offset clips. This antique champagne silver wood picture frame features distress markings along the edges of the frame face, with a scooped inner lip. The profile width is 1 ½”, and the rabbet depth is a mere 5/16”, making this profile best suited to thin paper items such as matted photos, fine art prints, posters, and matted watercolor paintings. This soft champagne silver wood picture frame offers a vintage or antique look and features a small beaded lip followed by a flat strip which leads to a bevel that ascends to a ridge along the outer edge that also features distress markings. 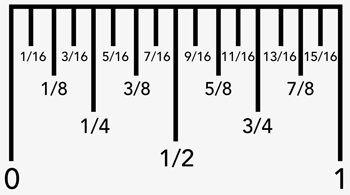 The profile width is 7/8” and the rabbet depth is ½”. Silver frame with a gold front edge. This profile is a bronze picture frame ideal for framing contemporary art, botanicals or modern photography. It addressing the renewed interest in vintage, re-purposed with a modern and sleek twist. The metallic pewter finish on this wood picture frame by Larson Juhl features a blend of high and low sheens to highlight a vintage look and provide visual inward direction. The finish is reminiscent of a sword’s edge. The profile is 1 1/8” wide, with a substantial 7/8” rabbet depth, making this vintage metallic picture frame ideal for both stretched canvas and matted artworks. The profile is mostly flat, with a small step along the outer edge, and slight aged look and texture that fades from the outside toward the inside of the frame, revealing a high sheen metallic finish toward the inner lip. The metallic pewter finish of this Spoleto wood picture frame by Larson Juhl offers a sleek and stunning vintage look that is reminiscent of a mythical and well-loved sword blade. The profile width is 2”, and the rabbet depth is 11/16”, making this frame ideal for matted works on paper and also original paintings on ¾” canvas. This gorgeous angled silver picture frame is inspired by the town of Spoleto, Italy, and features a shiny metallic finish along the inside edge, and fades into a slightly textured, tarnished look to simulate age. The profile width is 2”, and slopes downward from the inside to the outer edge. Silver picture frame with a gray wash & a small beaded lip. This Colonial-style silver picture frame moulding offers the look of water gilded silver at an affordable price. The profile width is 2”, and the rabbet depth is ¾”, so this frame is well suited to stretched canvases and other materials up to ¾” thick. This vintage silver picture frame features a small step along the inner lip of the profile, and a distressed finish to simulate the look of aging. The profile width is 5/8”, and the rabbet depth is ½”, making this thin silver picture frame ideal for matted photographs and artwork on paper. This shiny metallic silver picture frame features a deep rabbet for framing anything from stretched canvas paintings, to shadowbox items, to float-mounted art, to matted works on paper. The profile width is ¾” and the rabbet depth is 1 ¼”. The shiny silver finish of this deep picture frame profile features a slightly hammered look, along with subtle black distress marks running linearly along a flat face. The side of the profile is a nearly black, dark brown. This petite titanium silver wood picture frame by Roma Moulding offers an elegant context for small wedding photos and gift frames with understated beauty. Delight wedding guests with picture frame party favors, or simply keep the frame for your own treasured wedding day moments. This thin distressed metallic silver wood picture frame features a narrow width most suitable for small items, with a slightly mottled finish that is also features subtle black scratch distress markings. The profile width is 5/8” and the rabbet depth is 3/8”. This small of a frame should not be built with either size larger than 24 inches. Hammered silver scoop picture frame. Web Picture frames carries some of the lowest priced Omega frames. Metallic silver picture frame with dusty grey/green wash. Pale silver gold picture frame with gray wash & bronze highlights & an ornate undulating petal pattern. This fluted concave scooped metallic silver picture frame features a unique profile shape, in which the inner lip ascends to a ridge, and then descends in a concave fashion toward the outer edge. The profile width is 2”, and the rabbet depth is ½”. Ornate picture frame with undulating petal pattern, silver with pale highlights. Limited stock, moulding has been discontinued. Pale silver gold picture frame with blue gray wash & bronze highlights & an ornate undulating petal pattern. This ornate silver wood picture frame features a unique fluted pattern that scoops up to a decorative ridge. A warm gray wash covers crevices and low points to simulate age. The profile width is 2”, and the rabbet depth is 5/8”. Pale silver gold picture frame with muted reddish orange highlights & fine light gray wash with an embossed delicate pattern. This decorative, aged, warm silver picture frame moulding is an excellent choice for classical themes that would be enhanced by Elizabethan ornamentation. In inner lip of the profile features a smooth, minimal scoop leading to a ridge that plateaus, followed by the body of the profile, which is highly patterned and decorative. The overall width of this frame is 1 ¼”. The profile width of this ornate, decorative silver picture frame is 1”, and the rabbet depth is 9/16”, making this profile ideal for matted fine artworks on paper, as well as prints, posters, and thin paintings on canvas board or rigid hardboard panels. This petite and dainty silver picture frame features decorative ornamentation that is reminiscent of cute ballet slippers. The repetitive pattern is a nod to the detail work of English Renaissance design and Elizabethan fashion. The profile width of this silver picture frame is 5/8” wide, and the rabbet depth is ½”, making this shape and size ideal for smaller images, or as a stacked frame combination along the lip of a larger frame such as V257. This decorative Art Deco silver wood picture frame features wavy striations that lend themselves to artwork that has a fluid theme such as underwater paintings of seaweed and mermaids, along with black & white or monochromatic illustrations and drawings. The profile width is 1 ¼”, and the rabbet depth is 5/8”. This distressed silver baroque wood picture frame offers a luxurious ornate feel that is perfect for home decor and beveled mirrors, along with original fine art prints and watercolor paintings. The profile width is 2”, and the rabbet depth is 9/16”. Distressed silver baroque picture frame with embossing from Omega frames. In the case of this ornate silver picture frame moulding, the wood profile substrate features a steep curve to which an embossed pattern is laid, and then a warm gray wash is applied, filling in crevices to simulate age. The profile width is 2 ¾” and the rabbet depth is 5/8”. V506 is a decorative wood frame moulding that has a warm gray-silver tone. The profile is 2 3/4” wide, with an outer edge that protrudes out more than the inner lip, with several miniature steps leading to a flat, decorative design. The decorative finish sits on a gessoed base, and incorporates a hammered dot pattern with swirls that complement vintage art, original paintings, and mirrors quite nicely. This decorative Art Nouveau distressed silver picture frame features a flat inner lip followed immediately by a decorative ornate silver protrusion that offers dots and swirls in a relief pattern. The remainder of the profile is a flat shape with black scratching on a silver finish to signify the look of age. This profile is 2 ½” wide, and features a 5/8” rabbet depth. Limited stock. Pale silver/gold with red veining picture frame with an embossed back edge and a black back. Heavy frame great for mirror picture framing. The profile width of this substantial frame is 3 ½”, with a rabbet depth of ¾”. This frame is deep enough for standard stretched canvas paintings on ¾” or 1” stretcher bars, and would also be an ideal choice for decorative home decor such as beveled mirrors and giclee prints on either canvas or paper. Warm silver picture frame with brown & black veining distressing give antique picture frame feel. This scooped silver wood picture frame by Omega Moulding offers a bold and blocky look due to the deep 2 ¼” outer walls. The smooth face of the profile scoops slightly out to a flat edge, highlighting the various planes due to a metallic finish. The rabbet depth is 1 ½”. This dark metallic pewter gray-wash wood picture frame offers a mottled finish over a convex rounded profile, along with a small black step that descends toward the outer edge and a black side wall. The profile width is 1 ½”, and the rabbet depth is ½”. This silver wood picture frame offers the look of silver leaf on a contemporary flat profile, with gold mottling on a beveled outer edge, and a deckled gold inner lip with accompanying gold specks. The profile width is 2 1/8”, and the rabbet depth is 5/8”. The profile width of this antique pewter and gold picture frame is 2 3/16”, and the rabbet depth is 5/8”, making this frame ideal for works on paper and shallow canvas paintings such as canvas boards, rigid hardboard panels, and canvases stretched on thin stretcher bars. Mottled cool silver picture frame that fades to light brown with torn edges & a black back. Cheap picture frame for the quality and look. Contemporary silver picture frame with slight cross hatch pattern from Larson Juhl. Frame is perfect for matching your brushed metal fixtures. V653 is a sleek and contemporary picture frame moulding with a flat surface and a cross-hatched, brushed nickel finish. The substrate of this moulding is real wood, which is coated in gesso, to which the metallic finish is adhered. V653 is an excellent choice for upscale bathroom mirrors, wedding portraits, and prestigious awards such as law degrees. This metallic steel gray wood picture frame features the look of ferrous iron, including pock marks that simulate the resulting look after hot liquid metal has cooled to a solid state. The profile width is 13/16”, and the rabbet depth is 9/16”. One of a large family of picture frames with the look of forged silver hammered metal from Larson Juhl. Rugged strong looking picture frame with a finish that resembles metal. One of a large family of picture frames with the look of forged oil bronze hammered metal. Rugged strong looking picture frame with a finish that resembles metal from Larson Juhl. The iron steel look on this contemporary metallic wood picture frame by Larson Juhl offers a unique alternative to industrial metal picture frames and hammered metal picture frames, while complementing beveled mirrors, graphite and charcoal drawings, and a multitude of contemporary genres and types of art. The profile width is 1 9/16”, and the rabbet depth is 1 3/8”. For centuries, artists and craftspeople have used materials and methods to push the boundaries of what’s possible in the name of beauty. This wood picture frame moulding captures the magic and spirit of that creative inclination, in the creation of a wood moulding that is made to look like ferrous iron.